The OH and I happily confess to liking Strictly, in fact my birthday treat in a couple of weeks is the live show in Sheffield, but we don't watch The Choir or any other reality shows. 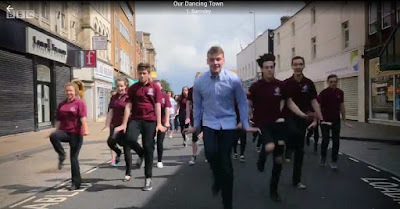 However when hundreds of local people were inspired to dance through our town last summer it wasn't something we were going to miss. BBC2 showed the first episode of 'Our Dancing Town' last night and Twitter exploded about it locally this morning. We watched on catch up tonight (Ok, I had sneaked an earlier view this afternoon while the OH was at work, and I teared up both times). Look to the left of the presenter's paper, see the poppy cross! 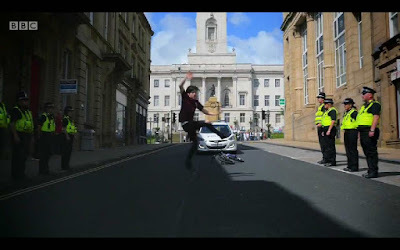 The whole thing started off well for us when the OH spotted our Battle of Jutland tribute on the steps of Barnsley War Memorial in the establishing shots. The OH had laid a poppy cross for me with attached list of names of Barnsley men lost at the end of May 2016, the 100th anniversary of the battle. It managed to stay on the memorial well into July despite getting very wet and the ink running eventually. We really enjoyed the whole programme, but I wasn't able to find many reviews or much background information online. I do so like knowing what I'm watching! It was fun spotting the 'Full Monty' like cuts from one part of Barnsley to somewhere miles away as well. 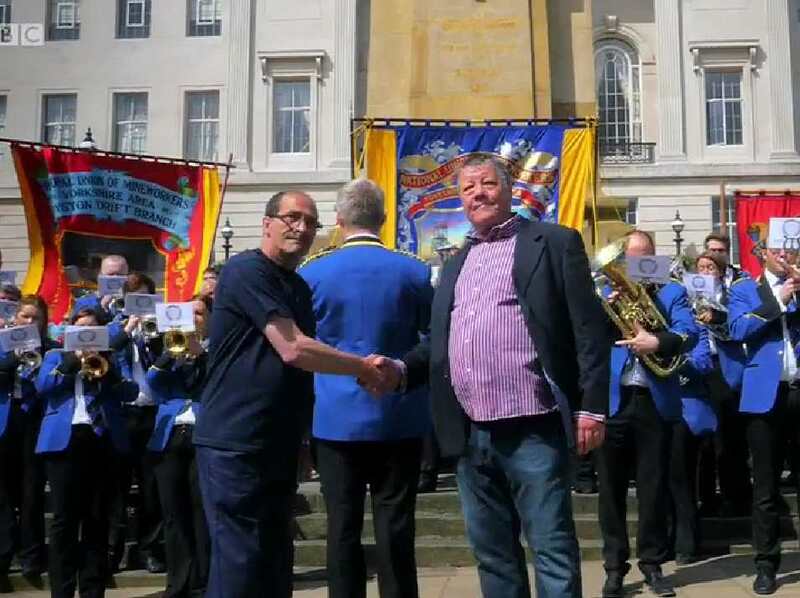 For example Nick from Woody's chip shop was in town one minute and up in Monk Bretton the next, admittedly behind another branch of his family's firm. Dave Cherry managed to whisk Steve Elias, the presenter, from Worsbrough Bank End to Barnsley Main quite quickly too! I did some screen shots off iPlayer later after much Googling trying to find out who the various groups were. I wasn't hugely successful I'm afraid but maybe people can add comments to this post and tell me! The actual performance began with the Old Silkstone Brass Band playing in front of the war memorial outside Barnsley Town Hall. The Barnsley coat of arms has a miner and a glassblower as the supporters, so the above handshake represents that. I guess finding a living linen weaver would have been a bit more difficult, a trade also represented on the shield of the coat of arms by shuttles from the looms. I do think the view of our Town Hall and War Memorial looking up Regent Street is quite perfectly formed! The young man from the RMC Theatre Company, Danny, was superb. The police were great sports too, joining in and allowing the whole thing to take over several streets that day. 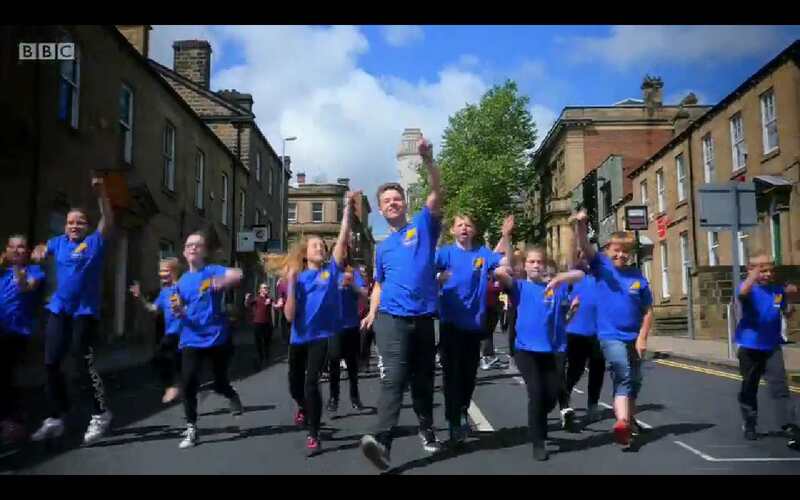 It was surprisingly difficult to find out who the theatre group were, but the sponsorship from Danny's father's firm MAS Staffing visible on the polo shirts and some comments on their Twitter account helped me out. 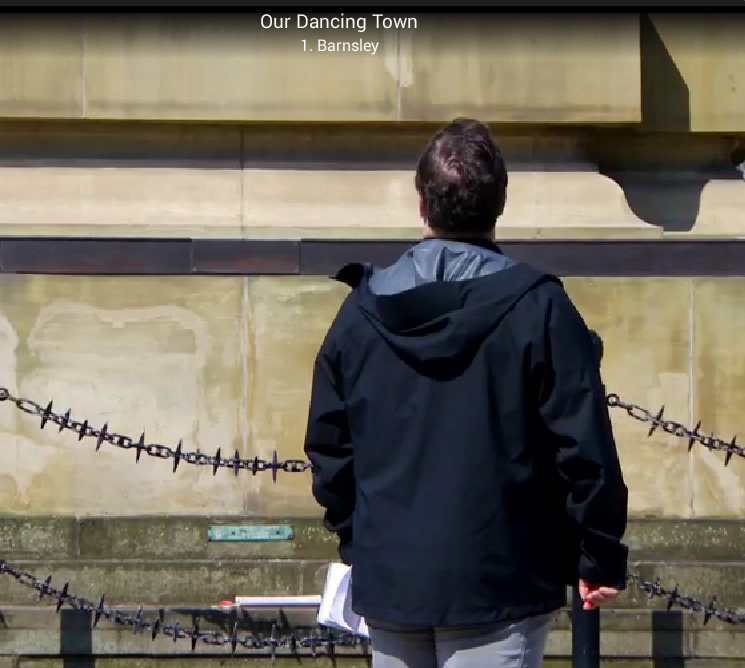 None of my attempts at screen shots do credit to the next bit of the dance featuring RMC ... I do recommend you watch it on YouTube. I don't know who these youngsters in blue were. Were they the ones rehearsing in the Lamproom Theatre earlier in the programme? Then we had the ballroom dancers and baton twirling ladies, neither group featured in the main programme so again I have no clue who they are. At the bottom of Regent Street lots of ladies in brightly coloured t-shirts joined in, maybe the ballet dancers? Behind them I could just see a kicking chorus line too. Who knows? Must mention the Sword Dancers (Barnsley Longsword) too! 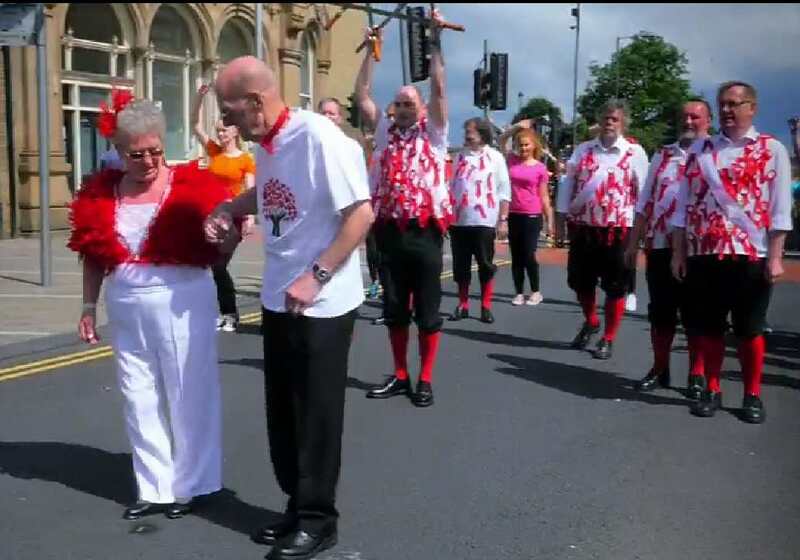 Including the elderly couple from the Barnsley Independent Alzheimer's and Dementia Support group was more special to me for the gentleman than his wife Joan the tap dancing lady, great fun though she was throughout. He reminded me of our visit to Beamish in May when the OH"s mum and I happily joined in some singing for people with dementia in the old Silver Band Hall. It was great fun and wonderful to see everyone having a good time. I think Nick from the chippy was my favourite. He was trying so hard, and he did look really happy as he was getting better at the routine in the practice. 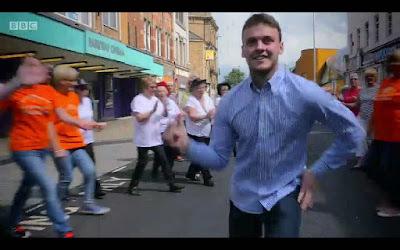 The screen shot above just catches the Line Dancing ladies coming in. Despite being in from the beginning and being shown practicing a lot their actual dance was hidden when the RMC youngsters came back in just after this. The combination of Nick and the RMC troupe was fantastic. Maybe he could join up with them for some more relaxed dancing experience, he's got the skills, he just needs a bit of Danny's confidence to brush off on him! I remember some lads at my school being into Northern Soul in the 70s. Giving my age away here! I am in awe of the athletic ability of the chap in the white t-shirt and blue jeans. That lady in orange at the front was bounding about impressively too. 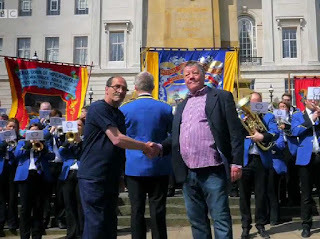 There was a bit of a gap between the Soulies and the Brass Band around the corner by the new market hall, and not being a football fan I didn't snip Toby Tyke. 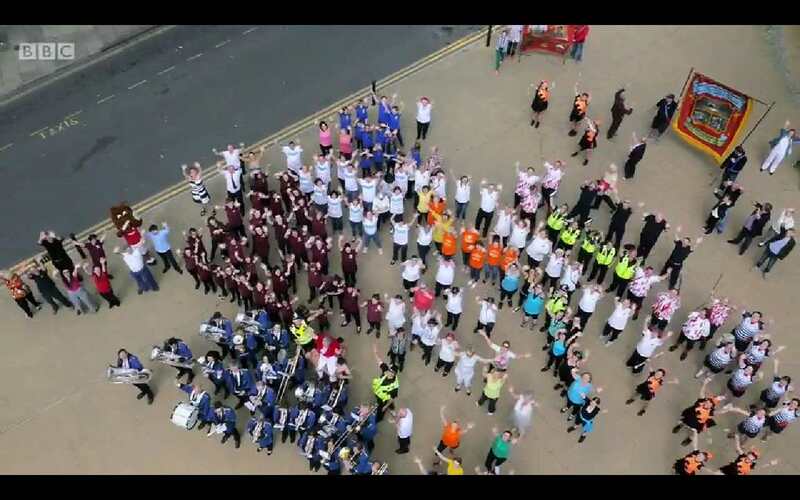 Loved it as RMC, Nick and the soulies pelted past the band to get into position in front of the bus station though. Everyone together now and Joan got her lift from the body builders as the camera swung upward into a huge overhead shot. That was great fun. I wish I'd known about it when they were doing it. Oh and Barnsley Archives staff Michael and Gill appeared in a meeting earlier on, but no dancing Archive assistants materialised I'm afraid! I'll add some more links to this post as I identify more of the groups involved. Now go and watch the full programme, while it's still on iPlayer. You won't regret it!